I have a confession to make. Five months ago, my sweet husband took advantage of a Black Friday promotion and bought me the Silhouette Cameo I had been drooling over for almost two years. The confession is the number of times I've used it: none, zero, nada, zippo. I'm hoping to get together with a new friend in the next couple of weeks for some Cameo tutoring. To gear up for our get-together, I put together a list of projects I really, really want to do. I love the labels we have in our freezer, but the foam stickers I used don't like the cold. They fall off if they're bumped. I would love to make vinyl labels to replace them. For that matter, I'd also like to update the labels in our frig, like how Project Simple Home has done. Please do NOT pin this photo from our page. Please pin from the source. 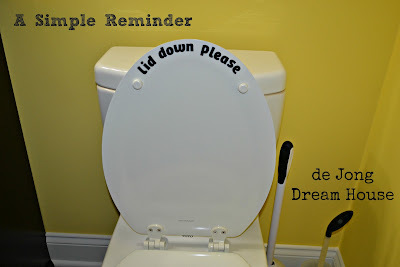 Also, I used foam stickers to put a few friendly reminders around the house for my boys. They work pretty well, except for when my overly-tired son would rather pull off and rearrange stickers than use the toilet before naptime. I'd love to replace my stickers with vinyl. Glamorous, I know. I have a bajillion other labeling and vinyl ideas. 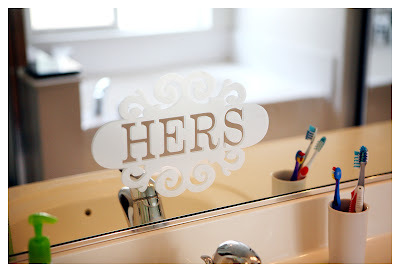 Did you know you can make etched glass with a Silhouette? 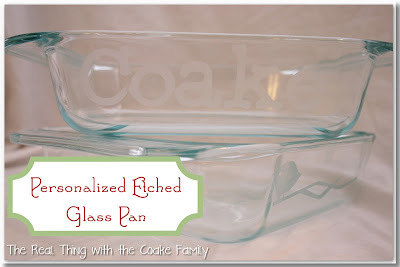 I'd love to customize our casserole dishes like The Real Coake Family has done. I also love what Dans Le Townhouse did with her mirror. 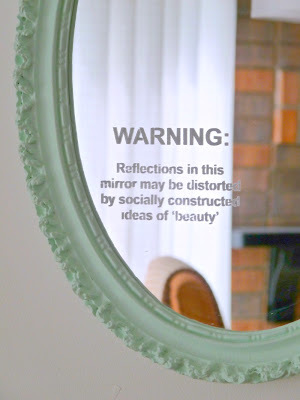 I have "Imago Deo" (image of God) on our full length mirror, written in puffy paint. Niels loves the sentiment, but not the execution. This would look a lot nicer! I also really like this idea from eighteen25. 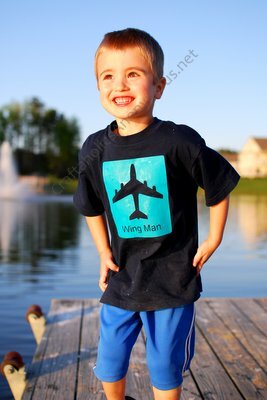 I would love to be able to make my train and space shuttle-obsessed boy custom tees like this one made by Craftaholics Anonymous. And I'd love to make custom onesies like The Thinking Closet has done for all the sweet babies my friends are having. I am absolutely giddy about the idea of using the Cameo with my new love of sewing. 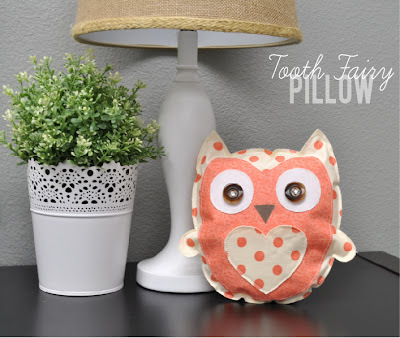 How cute is this tooth fairy pillow? 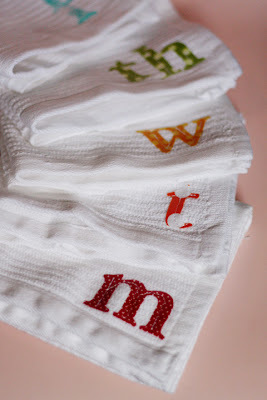 And I'd love to be able to cut out letters for monograms on quilts or to make cute projects like these days of the week dishags from Knitty Bitties. 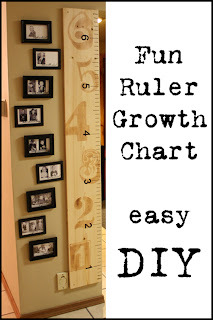 As part of my 2013 Pinterest Challenge, I want to make a growth chart ruler like this one from Adventures in Decorating and Design. Click below to follow my ever-growing Silhouette inspiration board on Pinterest. I'd love to hear from you. Do you have a super simple tutorial to get me started? Crystal and Co. * New Nostalgia * Real Coake * Sew Much Crafting * SNAP! Glad that you got that confession off of your chest, and now that you did, I'm even MORE excited about our get-together and Silhouette sesh! Your inspiration images already have my mind a' reeling with ideas. I think we can definitely tackle the refrigerator labels...and maybe even a heat transfer vinyl t-shirt or onesie. Those have been on my to do list, as well! It will be an honor to be your buddy as you tackle your first few projects. You'll see that once you get over the initial intimidation and learn how the Silhouette works its magic, you'll be whipping out projects on your own left and right. Can't wait to see you soon, Jen! P.S. Those days of the week dishrags are TOO SWEET! What a wonderful idea for a wedding present or shower gift. You have such a great eye for fun projects! Ok I have to tell you I have a cutter (mine is the Kilc and Kut ZING) and it sat for a year unused so I know how you feel. My advice just forget it and start playing. Get the cheapest vinyl and be prepared to maybe break a few blades/mats but once you get it happening you will want to cover every blank surface. Seriously just play, you will mess up but it doesn't take long and then you'll wonder what you were so afraid of. The guy who sold me mine actually said this is really common and assured me I couldn't break the machine :) good luck! Mel, you have totally made my day! I'm so relieved to know I'm not the only one! I have high hopes that I will make my first project in the next week or so! Stay tuned! 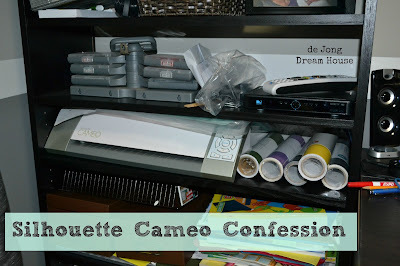 I debated between the Cricut and Cameo, but the Cameo won out because I don't have to buy cartridges. Of course, since I haven't used it yet, I'm still working on making it worth the money! Looks like a great list of things you want to try. Thanks for including my personalized pyrex pans in them. 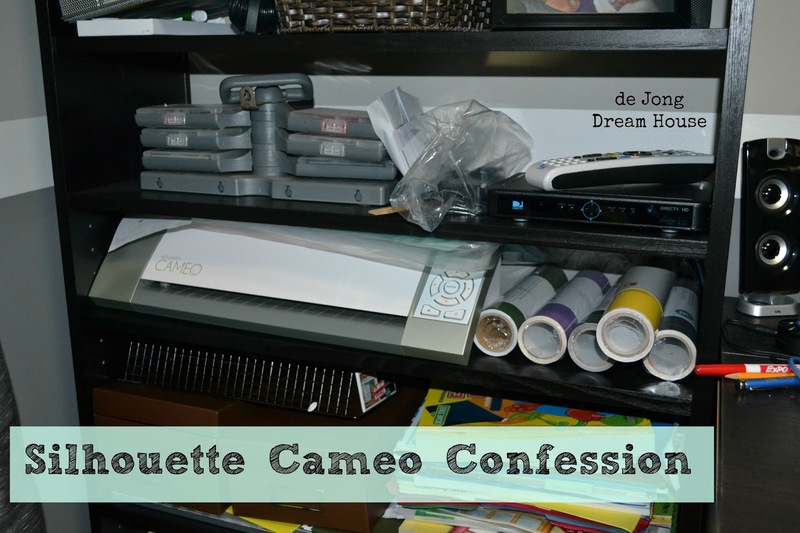 I have no doubt that once you being to learn the cameo you will be off and running, just like you were with sewing. Hopefully getting together with your friend will get you going. It can be a lot of fun. You are so welcome! Your pans were one of the reasons I wanted a Silhouette in the first place! I hope to be posting about my first project soon! I also bought a Silhouette Cameo/SW bundle on the same sale. Very easy to use and great fun. If you are nervous, just check out the tutorials on a variety of blogs, as well as youtube videos. But it truly is easy you just need to pull it out and have fun creating. But, I think you'll enjoy getting together with your friend. Thanks for stopping by. You've made some amazing quilts! You're building my confidence that I can master the Silhouette!